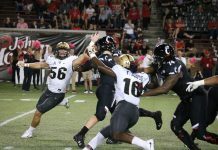 CINCINNATI, Ohio – Second-year quarterback McKenzie Milton became the full embodiment of what Head Coach Scott Frost saw in his true-freshman starter last season, torching the Cincinnati Bearcats for a career-high five touchdowns and 374 yards in the construction of a 51-23 win at Nippert Stadium. The game ended with 0:04 left on the clock in the third quarter, shortened by American Athletic Conference officials who called the game – citing player safety as a primary concern. Lightning delayed the game for an hour and seven minutes before the final was official. Cincinnati had no answer for the Knights’ aerial assault, apparent from the first drive of the game. UCF took four plays to find the end zone on a 54-yard touchdown to Dredrick Snelson, notching six points and removing just 1:21 off the clock. From that point forward, the floodgates were open. The Knights would score on eight-of-eight drives through four quarters, striking explosively and often. Everyone got a piece of the action tonight. McKenzie Milton hit eight different receivers (three of them for touchdowns), six different players carried the rock and two of those scored. He started the game 5-5 for 172 yards and two touchdowns before tossing his first incompletion. Tre’Quan Smith pulled down three touchdown receptions and rushed for one more, totaling four on the day to pair with his 165 yards. The Cincinnati defense was out-classed in terms of speed and skill, swimming in the wake of Smith and his receiving corps all game. UCF receivers averaged 23.4 yards per reception and the backs gashed the Bearcats for 141 yards – good for 515 yards, the third time UCF has eclipsed the 500 yard benchmark this season. Normally the UCF defense sets the tone game in and game out, but the heavy-handed-hitters took a backseat to their UCFast counterparts, letting Cincinnati score more points than any team has on them all season. “I just don’t think we played great on defense, and I thought they had a really good plan, and I thought they played well on offense, I give them a lot of credit,” said Frost. Cincinnati quarterback Hayden Moore was the silver-lining in the Bearcats’ cloud of despair, sneaking three touchdowns past the Knights; two on the ground and one through the air. That being said, he also threw an interception to defensive lineman Seyvon Lowry – who now has back-to-back games with a pick. 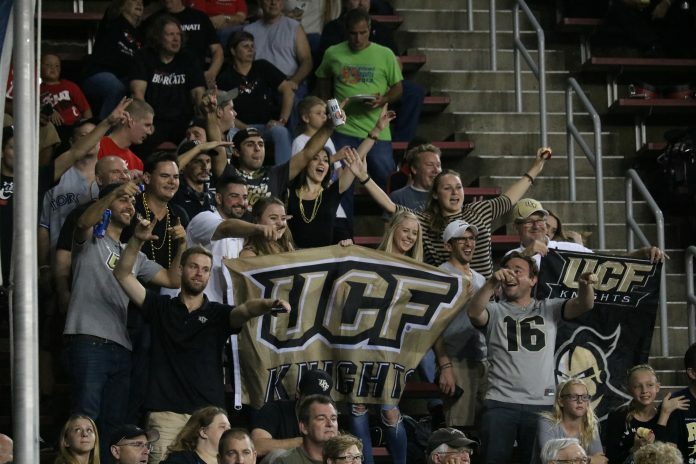 UCF outperformed Cincinnati in all three phases, but ran into a little bit of penalty trouble along the way. Concurrent with their previous three performances in 2017, the Knights elicited 44 penalty yards on eight calls against them. 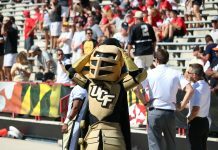 So many penalties are worrisome, but a minor issue considering the manner that UCF has beat the brakes off teams through four weeks of football. In a game that last year’s team may have let get away from them, potentially losing focus on the heels of a landmark victory, Orlando’s Hometown Team outgained Cincinnati 515-391 while running 26 less plays. 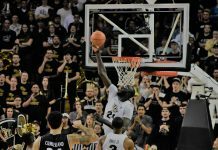 It was another case of halftime certainty, another chance for UCF to keep chopping wood with the game in hand. The team didn’t get to finish out the beatdown, but will take the TKO. There was simply no stopping the Knights in their first 4-0 start since joining D1 college football.